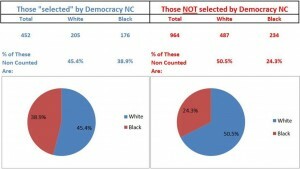 The response featured tables that compared the 452 voters Democracy NC sampled with the 964 voters the group ignored. Pizzo suggested the omission of so many voters had the effect of misleading the public on the law’s effect. For example, while 27.1% of the approved ballots belonged to voters identifying themselves as black, only 19% of all voters actually were black. Using the same reasoning that Democracy NC used on unapproved ballots, one could claim there was a bias in favor of black voters in the provisional ballot approvals. The original Democracy NC “research” included the twelve most emotionally manipulative cases of people whose votes were not counted, the group asserted, because the practice of registering and voting on the same day (called SDR voting) had been outlawed by the most recent General Assembly. The VIP response included a case-by-case analysis that Jay DeLancy conducted after investigating the details surrounding each specific voter’s problem and then consulting with other election officials familiar with the practices and training required (and funded) by the state. Democracy NC glossed over the details of such systematic failures, and used selected aspects of their stories to support reinstatement of SDR voting, which is a provision that both the Voter Integrity Project and most professional election administration officials agree is too permissive of fraudulent voting. Please click here to read John Pizzo’s response to Democracy NC’s “research” on same-day registration. Please click here to read Jay DeLancy’s case-by-case analysis of the 12 voters used by Democracy NC to manipulate public opinion.